RasterSymbolizer is used to draw a geo-referenced raster image (e.g. satellite image, scanned historical maps, etc.) or terrain elevation data (e.g. DEM) as shaded relief. ColorMap element defines a set of control points, called ColorMapEntry, which are used to colorize an elevation map. Each ColorMapEntry element specifies the color and the quantity value, which is altitude of elevation. 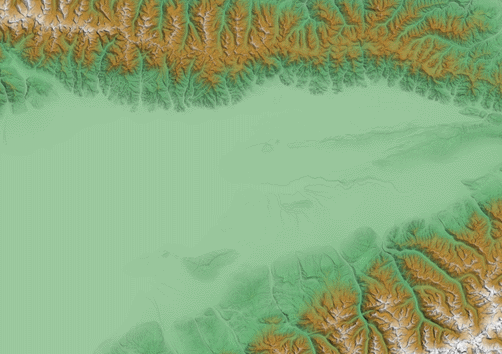 In hillshading, the color of each elevation point is computed using linear interpolation between two color map entries with altitudes above and below the given value. The following examples demonstrates a ColorMap to produce a shaded relief given below. ShadedRelief allows to set parameters of hillshading.